While I was far from the horror comedy's most enthusiastic of supporters, I did have an undeniable admiration for the focus on fundamentals and creativity that "Happy Death Day" carried and sold itself on. Although that appreciation for the original movie's "Scream" meets "Groundhog Day" premise has really grown on me over time, it also positioned the film to function almost exclusively within the context of being a charming one-and-done movie. How exactly this novelty can be taken to franchise status was always beyond me but where there's will to make money, Hollywood will find a way to exploit it. 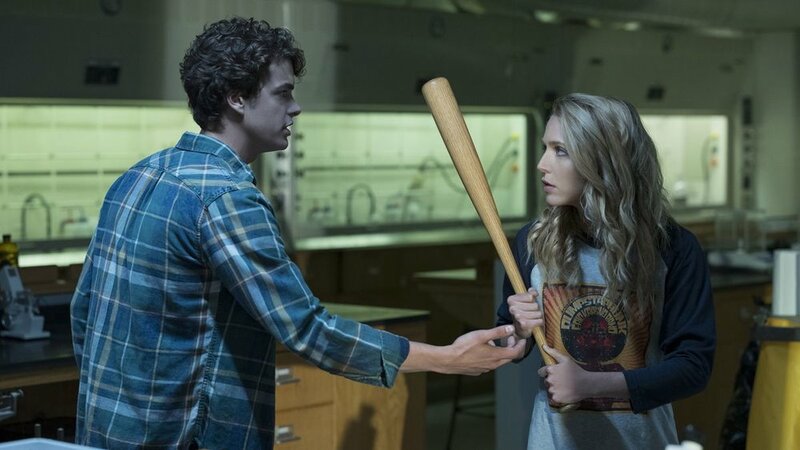 Beginning at the exact moment of the first film's ending, "Happy Death Day 2 U" opens on science major Ryan undergoing the same time loop shenanigans ending in his own murder that sorority girl protagonist Tree (Jessica Rothe) had to endure. Upon discovering that the cause of the phenomenon may be linked to Ryan's thesis project, Tree finds herself locked back into her time loop and must find a way to escape it and save Ryan, with the unfortunate catch of the physical damage of her deaths slowly mounting and tearing her body apart. Repeating the shenanigans of "Happy Death Day" — a film that was contingent upon emotional development of its protagonist rather than the logistics of its plot — was never going to work for a serious narrative of any sort. For that reasoning, "Happy Death Day 2 U's" first hint of sheer brilliance is to simply torpedo the notion that this narrative is meant to function as a serious horror movie. The means by which the film justifies its existence reveals itself within the first 15 minutes, and sets the tone for the movie's gloriously over the top, comedic B-movie nature. I can't quite say that the creative decision will work for everybody, but the absolutely bonkers territory the movie is willing to venture into makes it overall bolder as both a sequel and a film compared to its predecessor. While "Happy Death Day 2 U" unapologetically indulges in the comedic aspect of a premise with seemingly no consequences — complete with self indulgence and darkly comedic deaths and even suicides — it still carries itself with heart in key areas, which give a surprising level of emotional weight to tonally independent antics. The script isn't without the occasional hiccups in its juggling act and most of the side characters, try as the actors might, never fully flesh out, but the film manages to admirably up its own ante as a sequel when it could have easily rested on its laurels. "Happy Death Day 2 U" dares to establish its own identity while framing a potential future installment in a way that leans into the beauty of its own flimsiness. If that sequel is half as fun as this one, I welcome it with open arms.